Hello everyone and welcome to my running story. I am runwithpower athlete Loren Sheets and I would like to share my journey as a runner and the goals I hope to achieve. How many of you participate in competitive track and field? I have been running ever since I was in elementary school, running the annual track meets held at the local community colleges. Way back then, the longest event was the 400 meter, which seemed like a really long race to a second grader. I was automatically drawn to it. I had decided that I wanted to run only the hardest races, which to me would be the longest races. As I grew up, I began to realize that I was more of a sprinter. I joined my first track team as a 5th grader, and ran events all the way from the 100 meter to the 1500 meter, as well as long jump and high jump. I remember in 6th grade there was an 8th grader I knew, and he ran around a 65 second 400. The 5th and 6th graders had an elementary track team, and the 7th and 8th graders were the middle school team, and both teams ran at the same meets. I had run around 67 seconds in my 400’s to that point, but I remember the day when I tied his time with a 65 of my own, and that seemed like a major accomplishment. I think that was the point where I decided that I wanted to focus mainly on the 400. All through middle school, I ran mostly the 400, and varied running the 200 or the 800. I remember in 7th grade wanting to run under 60 seconds, but just coming short of that mark, running a 61 or 62. In 8th grade I made a big jump down to about a 57, which mostly can be attributed to physical growth and maturity. I had never really trained up to that point; track practices as a middle schooler and before were basically unproductive, and I’m sure if you have ever been on a small private school middle school track team, you know what I mean. 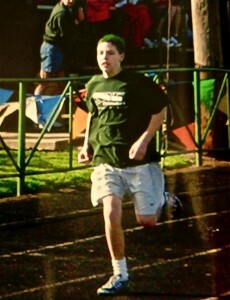 The summer before my freshman year was the time when my goal of running under 50 seconds really began to take form. Watching Jeremy Wariner run a 44 flat to win the 2004 Athens Olympics, as a 20 year old, really changed my entire perspective on the 400, track and field, and running. I just turned 20, and I have not yet reached my goal. I have gotten within a second and a half in the past 2 years, but this year I hope my training comes together perfectly and finally break the 50 second barrier. Now you have a little background into my passion for running. In the next post, I would like to talk about my high school track career and the different phases of my training, the positive aspects as well as the setbacks, and how those affected my performance. Thanks for reading! It seems you’re really passionate to get under 50 and have been working hard to get it. I’m looking forward to seeing how you do and good luck!